U.S. Senator John McCain is criticizing the foreign policy of the Trump administration, saying it is not focused enough on human rights abuses around the world. He criticized recent comments made by Secretary of State Rex Tillerson who said conditioning U.S. foreign policy too heavily on values creates obstacles to advance U.S. national interests. “With those words, Secretary Tillerson sent a message to oppressed people everywhere: Don’t look to the United States for hope … We make policy to serve our interests, which are not related to our values,” McCain wrote. 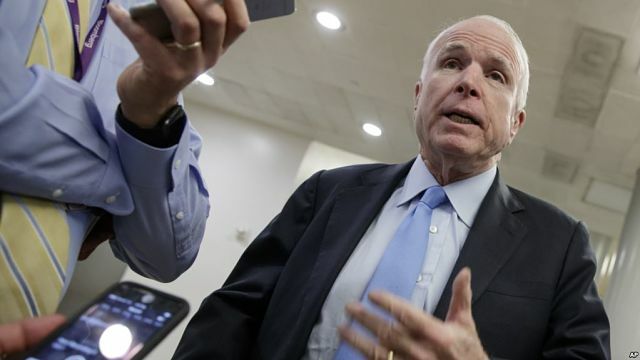 McCain, a Republican senator from Arizona, has criticized the Trump administration on a range of issues, including the president’s immigration orders and wish to have better relations with Russia. McCain has also sparred with the president about comments he made on the possible legality of torture and gave only a lukewarm endorsement of Tillerson during his confirmation process.